I have always been open about my love of cardigans and my love of sequins. There’s just something about sparkly clothing that makes me giddy. Of course I squealed with delight when I saw the August Silk Sequin Topper! This is the kind of piece that I would wear day or night…seriously. 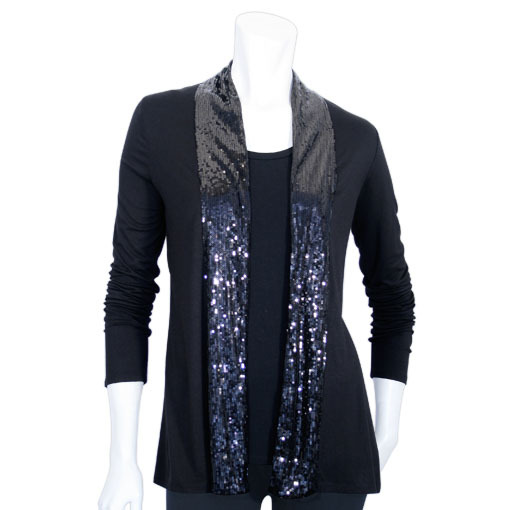 It’s an open front, drapey cardigan with a sequin placard and that makes it so versatile. You can dress it down with jeans/jean skirt and a tank on the weekends or you can totally dress it up in the evening with a pencil skirt over on a great fitted dress. This is one of those pieces that seems absolutely perfect for the holiday season and beyond. The only thing that would make it even better in my book is if it came in multiple colors. I could totally see this in a gunmetal grey or a deep burgundy. So this is my kind of dress up/dress down wardrobe staple, what kind of piece do you have in your closet that can go from night to day? .-= Courtney´s last blog ..Sad Day in The Premier World… =-.